Lock in a great price for Holiday Inn Abu Dhabi Downtown – rated 8 by recent guests! The mattress is so nice, good for people that have back pain. Perfect value for money. The manager on duty (Jordash) not too sure of his name, was amazing, very friendly and extremely helpful. Attentive and caring staff and the room was very comfortable, the bed and soft linens deserve a special mention! Breakfast is very good and the property is located shopping area which is very practical,staff are very accommodating to guest. Kudos to the chef at the egg station. ☺️ Bed is comfy, pillows are my favorite. Location wise is perfect. Beautiful view of the city......... Breakfast was awesome !!! The pool area and the gym were clean. The only good thing about the hotel is it is in the downtown. Clean and comfortable - staff is friendly, helpful, and respectful :) would definitely stay there again. Holiday Inn Abu Dhabi Downtown This rating is a reflection of how the property compares to the industry standard when it comes to price, facilities and services available. It's based on a self-evaluation by the property. Use this rating to help choose your stay! Holiday Inn Abu Dhabi Downtown is located in the center of Abu Dhabi, in the business district, 9.3 mi from the National Exhibition Center. The hotel features a rooftop swimming pool. A highlight of the stay is without a doubt the availability of appetizing food and beverages provided in exceptional restaurants and bars completed with a contemporary décor and relaxed ambiance. Choose from a variety of options ranging from International, Pan Asian, Arabian to local cuisine. Room service is available 24/7. Holiday Inn Abu Dhabi Downtown is 1.9 mi away from Abu Dhabi Marina and its yachting activities. Shopping malls and the Corniche are within walking distance and the property is close to many embassies. When would you like to stay at Holiday Inn Abu Dhabi Downtown? Featuring a city view, this air-conditioned room offers a flat-screen TV, a mini-bar and an electric kettle. 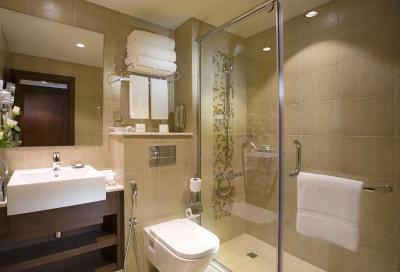 The bathroom includes a shower and free toiletries. This newly renovated room features two comfy beds with highest quality pillows. Stay connected with free high speed internet access. 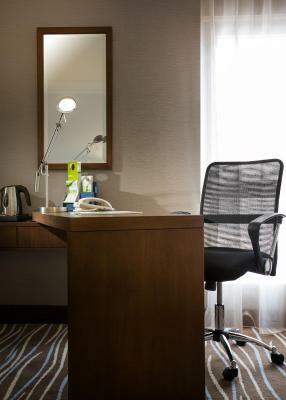 Business amenities include work desk, ergonomic chair and in room safe. This nicely decorated 30 sqm corner room lets you surf the web with complimentary internet access. You can watch your favorite show on the flat screen TV or stay productive at the convenient work desk with an ergonomic chair. The king size bed will comfy pillows will help you to have a great sleep. The exquisite suite will cater to all your needs. Enjoy comforts of home with soft seating while watching your favorite shows on the flat screen TV. Stay productive with a well appointed working area with a big working desk, ergonomic chair and complimentary high speed internet. The room is fully equipped with kitchen, microwave, hot plates, washing machine with full dryer and refrigerator. With ample of luggage and storage area in the room, feel the space you need. Wifi is complimentary. Baby cot and rollaway bed are available upon request. -Free Late Check out till 1500Hrs subject to availability. -Free Early check in at 1000Hrs subject to availability. The room is fully equipped with kitchen, microwave, hot plates, washing machine with full dryer and refrigerator. With ample of luggage and storage area in the room, feel the space you need. WiFi is complimentary. Baby cot and rollaway bed are available upon request. House Rules Holiday Inn Abu Dhabi Downtown takes special requests – add in the next step! All children under 16 years are charged AED 150 per night for extra beds. Holiday Inn Abu Dhabi Downtown accepts these cards and reserves the right to temporarily hold an amount prior to arrival. Please inform Holiday Inn Abu Dhabi Downtown of your expected arrival time in advance. You can use the Special Requests box when booking, or contact the property directly using the contact details in your confirmation. I didnt like the breakfast buffet. The food is not tasty and there's only few options in food. The bed and pillows are so comfy. The breakfast had so many options but didn't taste that good. The reception staff was really nice, and provided me to get Me check in early as I had infant with me. And provided me better clean room. And the room was absolutely relaxing. Very fast check in .Clean and very comfortable room. Perfect Location, excellent staff. Good Facilities. Few selection of food, very simple order of sunny sideup egg he cant prepare well, front dest on the restaurant during breakfast didnt assist guest, its 1 star rate for their breakfast menu. TV very old model, telephonr not working, socket plugs not working.